All-hay and alfalfa February hay price averages moved slightly higher in USDA’s most recent Agricultural Prices report released last week. The all-hay price was $126 per ton, up $2 per ton from the previous month but remains $9 lower than February 2016. 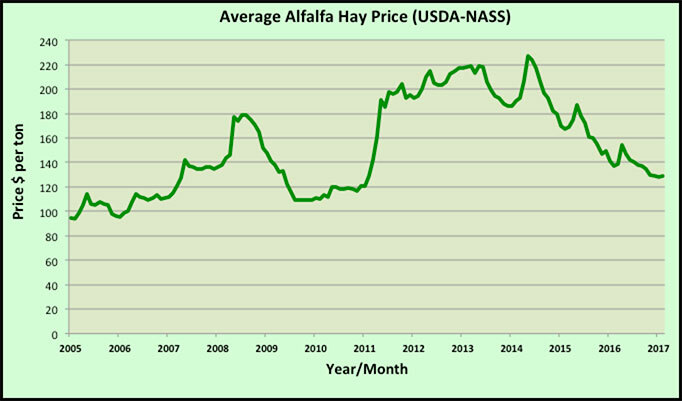 Hay other than alfalfa was up $3 per ton from $119 to $122, $7 per ton below February 2016. The month-to-month alfalfa price was up $1 per ton in February to $129 per ton, which is $8 per ton less than one year ago. Though a small month-to-month positive change, the upward movement in alfalfa hay price was the first price improvement since April 2016. The largest alfalfa price gainers in February were Arizona (plus $15 per ton), Idaho (plus $10), and Wisconsin (plus $10). 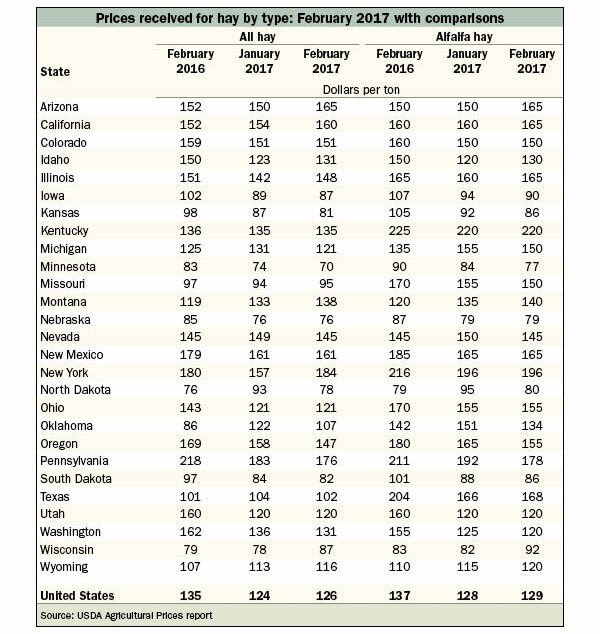 Those states with the largest price declines included Oklahoma (minus $17 per ton), North Dakota (minus $15), Pennsylvania (minus $14), and Oregon (minus $10). The highest alfalfa hay prices are being reported from Kentucky ($220 per ton), New York ($196 per ton), and Pennsylvania ($178 per ton). The lowest prices can be found in Minnesota ($77 per ton), Nebraska ($79 per ton), North Dakota ($80 per ton), South Dakota ($86 per ton), and Kansas ($86 per ton). Whether the higher average price is the start of a trend or just an anomaly remains to be seen. The USDA’s Prospective Plantings report released last week projected fewer U.S. hay acres in 2017. The growth rate of forage inventories has also started to slow. Even with these positive price factors, commodity prices for both beef and milk along with growing season weather will ultimately drive hay price direction in 2017.